I have to say it: I was nervous when I heard about Duncan’s Screaming Eagle line. I wasn’t a fan of the Metal Zero, or the MG, and was really worried that the Screaming Eagle line was just an attempt to fill a market gap. 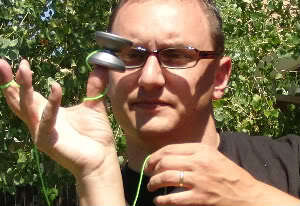 Having said that, I really do like the greater majority of Duncan yoyos, and Duncan as a company. After all, where would any of us be as yoyoers without good old Duncan? A lot has changed in yoyo construction since the Oldie McOldsmith wood axle days, and even since the inception of the Freehand Zero some seven years ago. I expect a lot out of all yoyo companies but none more so than Duncan; a relatively gargantuan company that has already set the bar very high for themselves. Duncan has always had pretty snazzy packaging but they really took it to 11 for the Screaming Eagle line. The Momentum hangs suspended in clear plastic in one of the most radical angled boxes I’ve ever seen. The yoyo itself is framed by a huge Screaming Eagle logo made of wing-flames (because that is a thing apparently) above, and “Momentum” on the bottom made of chrome-flames. My inner 13 year old is screaming at my inner mother “can we get it please please please please?? ?” My review unit has a smooth, vibrant red anno finish with a really sweet silhouette eagle on the edge of one half, and a white-flamed silhouette “Momentum” on the other edge. There is no mention of Duncan except on the bottom of the packaging hidden where toy stores like to put their UPC code. Unless you happen to know that the eagle silhouette is the “Screaming Eagle” eagle, which is a Duncan thing, it is conceivable that a layman would never know it was a Duncan yo-yo. I think if a yoyo is going to have graphic embellishment at all beyond the anno, there should be some kind of company logo somewhere on there, but that’s just me. All in all, the Momentum has a sharp, clean look about it. The hardware in this thing is friggin’ solid. I don’t mean heavy, Dodge Ram solid. I mean foolproof, will-not-break Honda Civic solid. The bearing seat has a little recessed area to catch bearing poop, which is a feature rapidly becoming mandatory in my eyes. With case foam, pocket lint, and the way kids get their dirty little hands on things the more cleanliness built in, the better. Speaking of bearings, this yoyo has the special honor of breaking me of my D bearing phobia. I don’t really know what my problem was before, but I feared D sized bearings like they were a Beiber crazed tween girl mob. I got about two days in before I had to open up the Momentum, and when I saw that D bearing, I had one of those embarrassing moments where you realize you’ve been enjoying something you previously feared for no reason. The recess is the perfect depth, and while I didn’t actually load any other pads up I am fairly certain the recess will fit any .555 pad (which is awesome.) I’ve seen too many pad recess yoyos take only one kind of pad. The side cap hardware is awesome, but I can’t help but get a wee bit nervous about it. The side bearings basically have a little bearing seat and are held in place by a thread-locked, hex wrench needing, hardened steel bolt. Holy crap. Now, I’ve complained about slippage/vibe issues from other yoyos’ take on side spinning bearing thingies, but holy crap. Don’t get me wrong, it works AWESOME, but if a bearing gunks up or something, it’s going to take not only tools but also time to remove and replace it. Honestly, though, the extra stability is worth the extra trouble. The Momentum curves very naturally into the gap and sits very comfortably in the hand. The inner cup has a nice rounded over edge for doing inner ring grinds, provided you aren’t using the big caps and/or don’t have thumbs so big it bothers people who sit next to you in coach. You know that look on your face when you aren’t sure you’re going to like a new food, but it turns out you do like it? You know, that look where you stop mid-chew, grin like a wide-eyed child, and say, “MOH MAN MUH SO MGOODMPH” because your mouth is still full? That’s kinda what happened to me when I threw the Momentum for the first time. It has a very unassuming look about it, but as soon as it hits the bottom of the string, it instantly feels both incredibly comfortable, and rock steady. The new Duncan pads give really good binds. Thanks to the recess, they manage to stay out of the way during multiple strings wraps. I’d also like to state that I’ve been trying my best to murder these pads the way I murdered the old Duncan cloth pads and I have not succeeded. A week of heavy review play has gone by, and you can barely tell they’ve been used. I am impressed. The Momentum moves fast, heavy and with authority. It still manages to yield gently for transfers, whips, and the like. It plays way heavier than it actually is without a painful thud at the bottom of the string some yoyos in the “heavier than 65 grams” weight division have. I found room to do decent IRG’s with the small caps in, but it took noteworthy effort considering the whole huge hand issue Chris and I share (High fives are like epic thunder claps though). The anno finish and curve are very good for a good, steady finger-to-arm grind, although the duration is kinda short. Given that it has none of the engineered grinding perks some yoyos have, such as grooves or special treatments, it’s really good. The side spinny gizmos perform admirably and will fit any side bearing caps that go with an A bearing, which is most of them. I really like the side caps that came with the Momentum. I know I’ve said “solid” like forty times in this review, but what can I say? 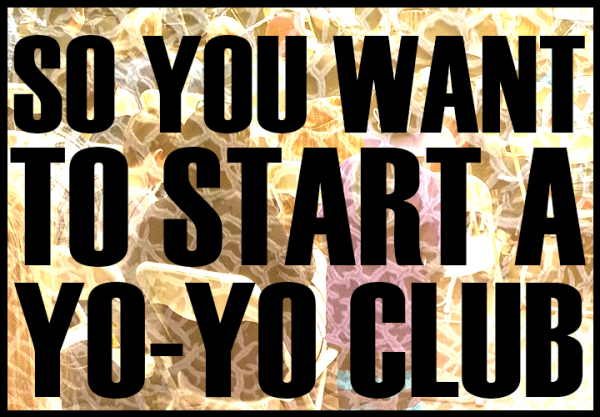 That’s what this yoyo embodies. 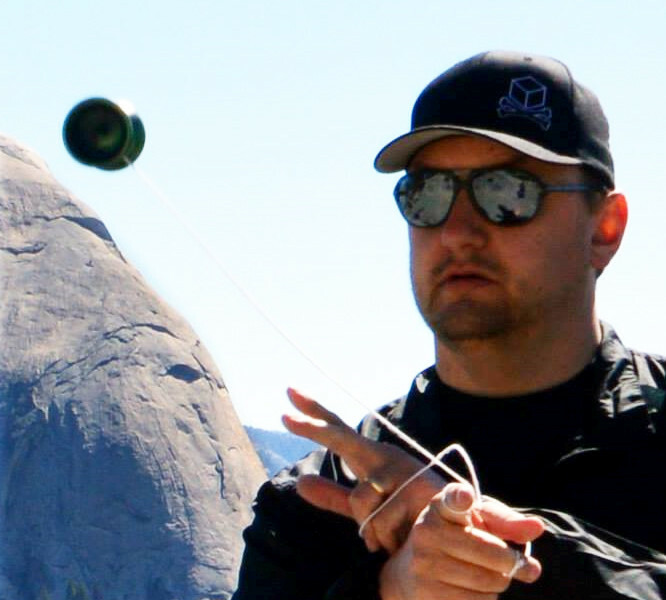 It is a perfect example of an extremely dependable high end yoyo. Before even half of my review week was over, I knew this yoyo inside and out. I knew how long it would spin, how quick it would move, how much force a reject took, exactly how to get a solid bind, the angle needed for a good arm grind stall, etc. It’s just one of those yoyos that you become intimately acquainted with very, very quickly. 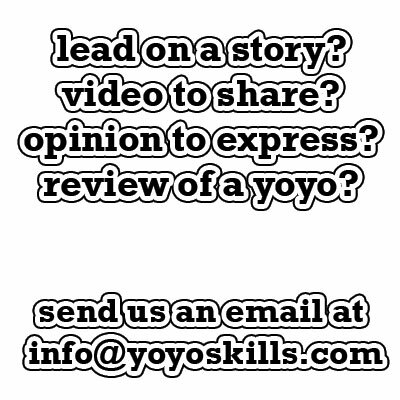 Some people think that makes for a boring yoyo, but I think the effect is much more positive than negative. Granted, in today’s yoyo market full of wacky shaped, yet monstrous playing yoyos, the Momentum does tend to come off as a little plain. And I say, so what? 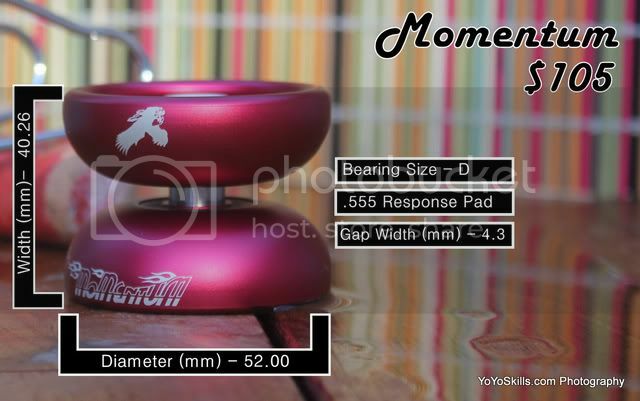 I think every company should have some kind of 65+ gram, mid-sized, simply shaped performer such as the Momentum. As for the side-spinnies, well, if you like them, you like them. I like them, for whatever that’s worth. The $100-110 price tag isn’t as competitive as it was a year or two ago, but this yoyo has enough horsepower to make it worth your money. Written by Dustin “Splugen” Gunter, who is Bizarro Chris Allen, complete with goatee. Edited by Chris “Dr. Yo-Yo” Allen who knows that Dustin means Mirror Universe not Bizzaro. August 22, 2011 @ 3:58 pm Lauren G.
I’m ok with Duncan not being blatant about the branding. It’s a pretty yoyo (I’m a girl..can’t help saying things like that!! ).